DAVAO CITY, Philippines (Mindanao Examiner / Apr. 15, 2011) – Two Filipino children’s rights institutions - the Children’s Rehabilitation Center and KABIBA ALLIANCE – marked this year’s commemoration of Earth Day with a workshop here on Children’s Environmental Rights, stressing the urgent necessity to take action against environmental destruction as one of the major threats to children’s health and safety. 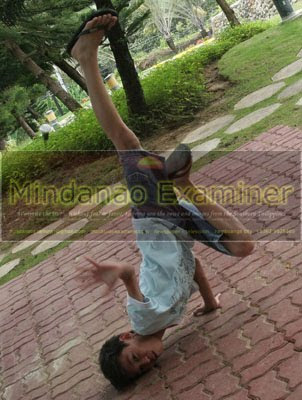 The workshop, held at the Sunken Garden of the Peoples’ Park, was attended by dozens of children. The young participants created posters showing the kind of environment they want to grow up in. On a big cloth, their hand imprints sealed their calls for clean air, water, seas and rivers, organizers said. Bearing the theme “Pagduso sa Katungod sa mga Bata Alang sa Himsog ug Makiangayon nga Kinaiyahan,” the workshop incorporated creative forms of educational inputs on the rights of the child, and their ecological rights. A story on the impact of climate change and coal-fired power plants was also presented. “The direct correlation between environmental hazards and children’s health is clear. It is the children who suffer most from pollutions caused mainly by heavy industries, lack of access to water, and other environmental factors,” said Girley Dela Cerna, Executive Director of CRC in Southern Mindanao.